/ Moomins And The Winter Wonderland: The Return Of Childhood Favourites. because I hadn’t really heard anything in the press about it, or even from friends and family who are also huge fans. The reason for much of this lack of information is simple: much like the original stories, comics, and TV series, Moomins And The Winter Wonderland is a Finnish-Polish collaboration, produced by Finnish Filmkompaniet and animated by Polish Animoon. But now it’s starting to rev up and more and more information keeps coming out. But, for those who don’t know, who and what are the Moomins, and why do we love them so much? The Moomins are the protagonists of Tove Jansson’s comics and books for children. They are doughy little balls of delight, an odd cross between a hippo and a pony, with culture and customs much like humans. They live a simple life, no doubt inspired by the childhood of Tove Jansson in the 1920s and 1930s in Finland, during the initial years of the USSR. The Moomins live out in the countryside, are largely self-sufficient, and find happiness in their quiet lives and their friends. Their friends themselves are of different species, from the nervous dog-like Sniff, to the almost human traveler Snufkin. Despite their differences in species and lifestyle, the Moomins and their friends treat one another as family, a reflection of the cultural ties which connected the different peoples in Finland despite their stark differences. The Moomins take a lot from traditional Scandinavian and Slavic fairy tales, especially from the fairy and troll characters in them. Their original name in Finnish was Mumintroll, testament to their millenia-old heritage. All around the world there are myths of fairy folk, but the ones in Scandinavian countries are oddly diverse, more a reflection of human life than anything else. In that sense, characters like the Moomins themselves reflect the diversity of human experience, whereas their friends are more representative of outside forces: the scholar in Hemulens, the inventor in Snork, and the adventurer in Little My, for example. It is for this reason that so many children loved the Moomins, their stories, and the TV series. It was like an updated fable, where valuable lessons could be learned from these strange creatures, and we could turn to them for answers about social situations in our own lives. Not only that, but they were cute and inoffensive, making it easier to relate to them than to the adults telling us the same stories. In recent years the popularity of the Moomins has declined in many parts of the world. There are many reasons for this, although the most obvious are that quality of life has gone up and social restrictions have decreased. As modern kids do not lead simple, fulfilling, but difficult lives, and as we are more free to talk to one another when we need help, we no longer turn to fables and fairy tales when we need something. In many cultures, such as Japan, where social norms are stricter and life is therefore a little more difficult, the escapism and metaphors of Moomin Valley are still welcome, and they are beloved by children and adults alike. However the West has lost interest in such carefree, simple characters, We seem to think we can’t really relate to them so much any more. However the Moomins still hold valuable lessons for small children, and it is for this reason that I am excited to see an updated version. The film itself is actually based on a cancelled 1980s film produced in Poland that was halted due to reduced interest and funds. However after the 2010 success of Moomins And The Comet Chase, they are renovating Moomins And The Winter Wonderland to bring it to the audiences who still love Moomins and their families. So far the voice cast is looking good, with Alicia Vikander taking the roles of Little My and Sorry-oo, and Stellan Skarsgard, the producer, as Moominpapa. They are also taking some stop-motion footage and using it as the base for the entire film, combining modern and older animation techniques. However their end goal is to restore and develop the film only enough to stay true to the original stories, whilst developing the plot, characters, and animation to appeal more strongly to a modern audience. Personally, I can’t wait to see the results! 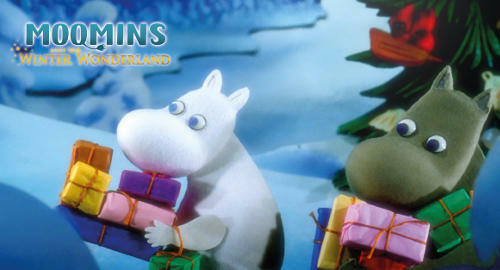 Moomins and the Winter Wonderland Trailer from GLOBAL GENESIS GROUP on Vimeo.